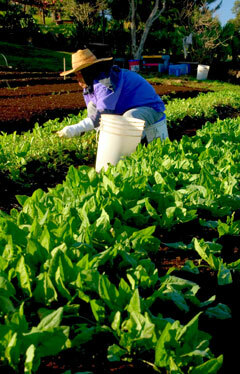 A farmer harvests spinach that will go straight to the Maui O'o Farm kitchen and tables of Pacific'O and I'o restaurants. Pacific'O and I'o restaurants executive chef James McDonald and owners Louis Coulombe and Stephan Bel-Robert have started tours of their upcountry Maui O'o Farm for all with an interest in the complete culinary experience, from farm to plate. Tours run 10:30 a.m. to 1 p.m. Thursdays at $50 per person, $45 for kamaaina, and $25 for ages 5 to 10. The price includes lunch, with menus based on seasonal produce and fishermen's catch of the day. A recent menu featured whole roast papio in foil with lemongrass, Tahitian lime, olive oil and herbs picked on site, kiawe-grilled beef tenderloin with stir-fried veggies picked minutes before cooking, a soup of fresh farm vegetables, and salad greens (also picked by the group) with feta cheese and balsamic lilikoi vinaigrette. Dessert was freshly picked loquats and chocolate pate. Guests may bring their own wines. Hawaii's climate allows for planting and harvesting year 'round. There are Maui onions, leeks, red beets, tomatoes, peppers, artichokes, nasturtium and marigolds, plus citrus, apple and stone fruit trees, cinnamon and curry, exotic hybrids like pluots, a cross between plum and apricot, and blood-red elephant heart plums. The long-term goal is for Pacific'O, I'o, and the Feast at Lele fine-dining dinner show to be produce self-sufficient. "Any chef's dream is to be able to control what comes in the door. To have such a personal connection to it is that much better," says McDonald. You can make reservations up until noon a day prior to the tours by calling (808)-667-4341 or (808)-661-8422.